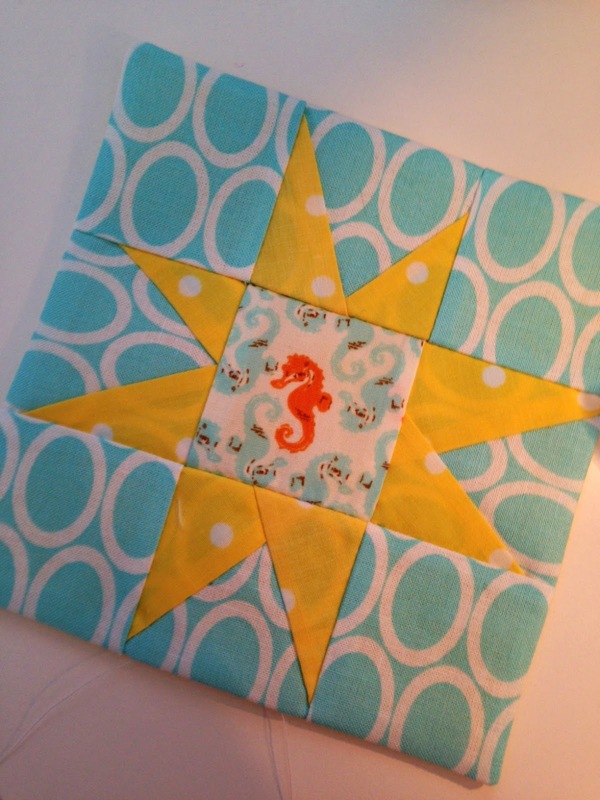 Little Bit Funky: 20 minute crafter--How to make a wonky star (pincushion!)! 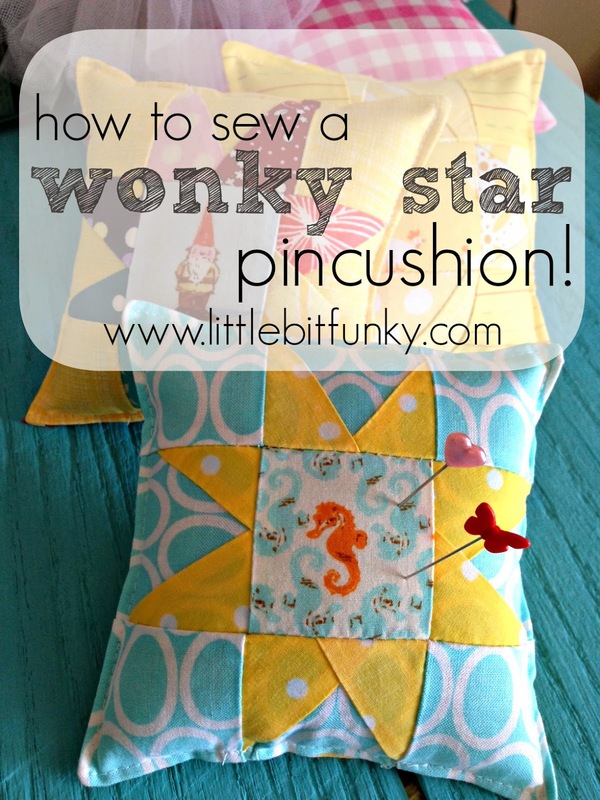 20 minute crafter--How to make a wonky star (pincushion!)! I've been creating these cute little masterpieces as a way of relieving stress lately! Something about focusing on something so small makes the BIG things in life I am dealing with a little less burdensome to carry! 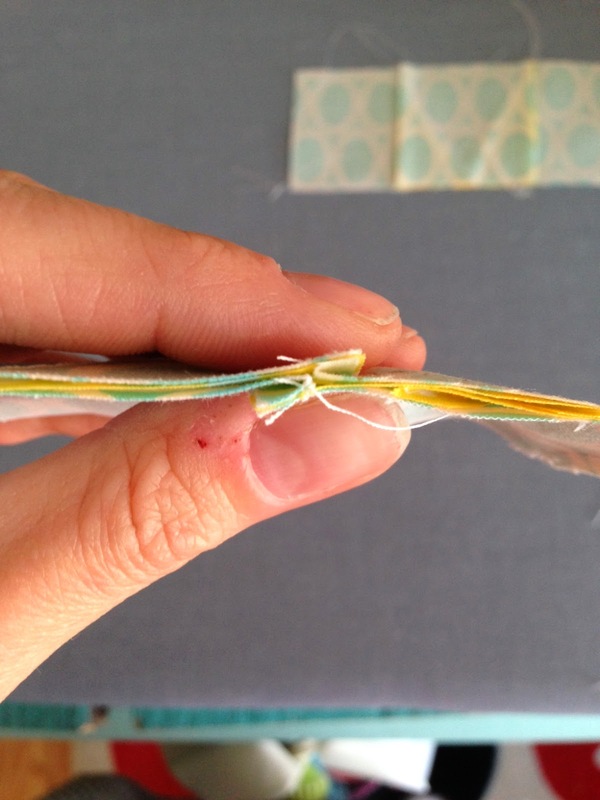 They are simple enough to create, just take a little time and patience. 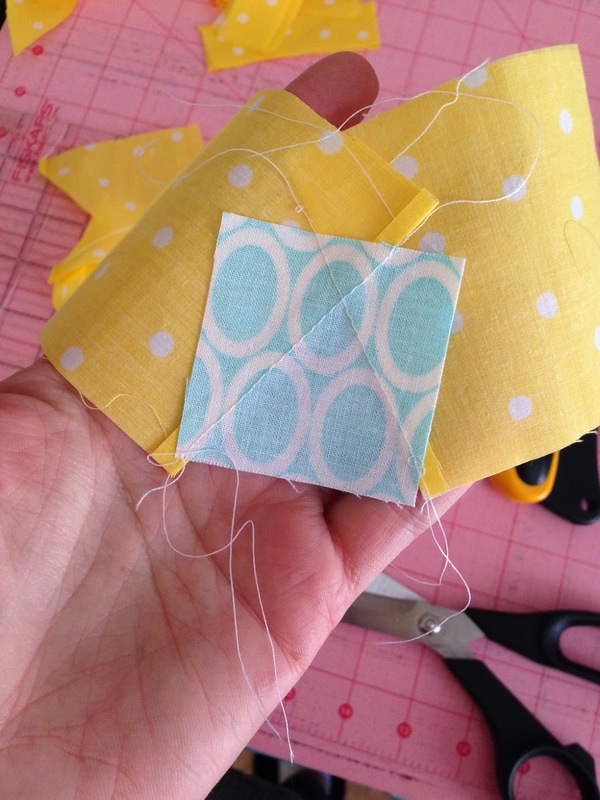 I've been posting them on my Instagram account (@littlebitfunky) and several people requested a tutorial, and well, here it is! 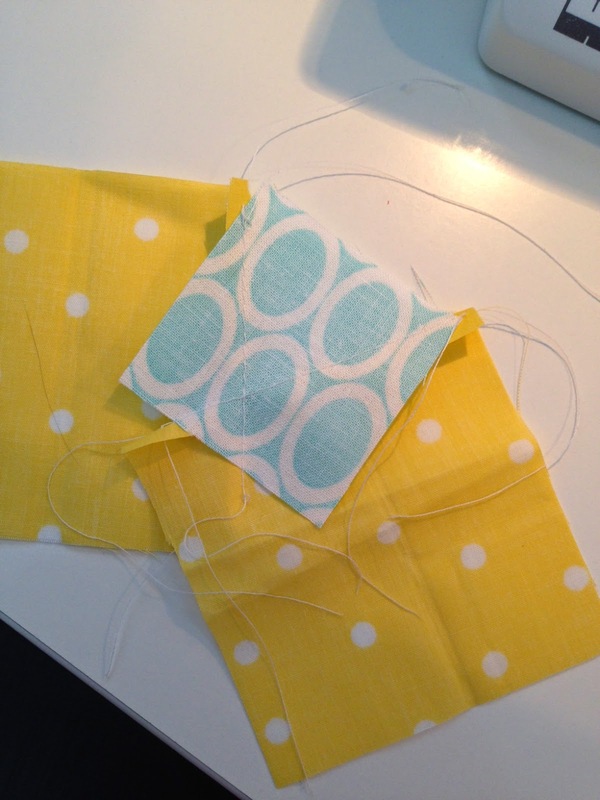 To make these tiny pin cushions you will need some fabric scraps, an iron and a cutting mat and ruler. You could probably make due without the last two if you really wanted to. 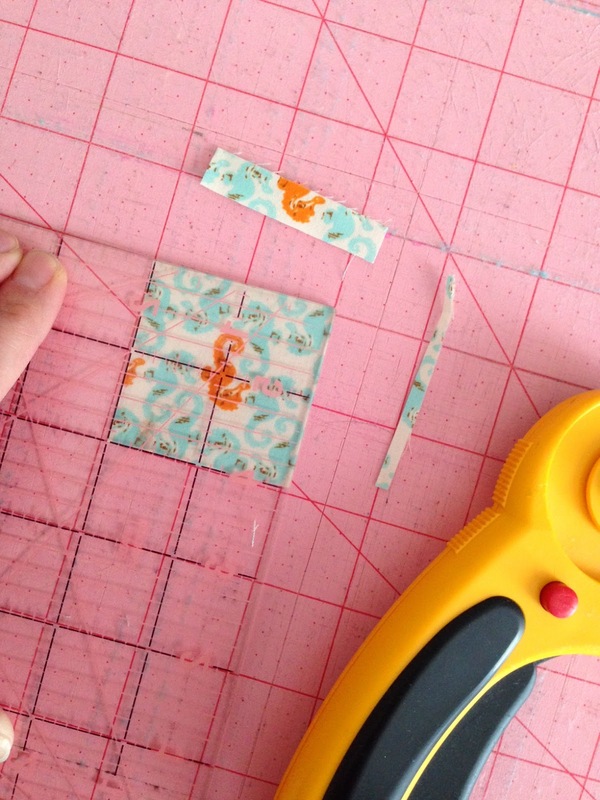 ...and cut the other two sides. 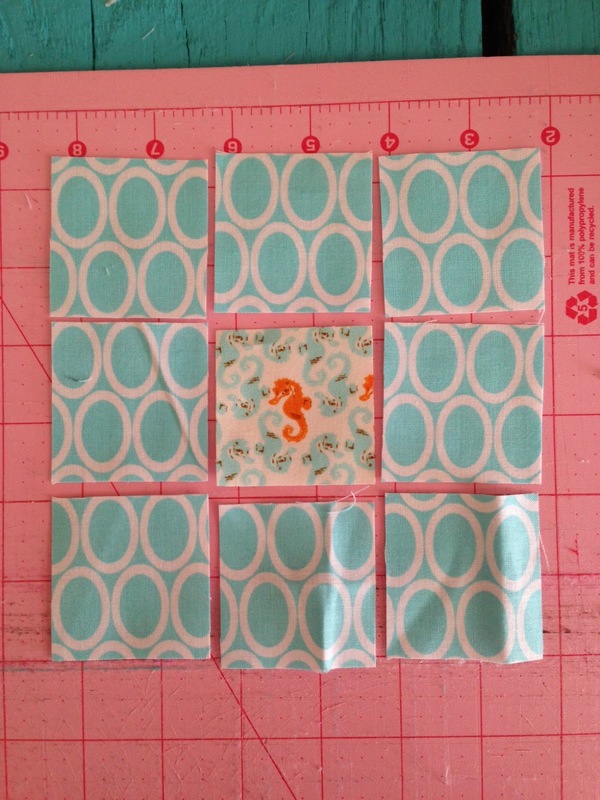 Next cut eight additional squares. 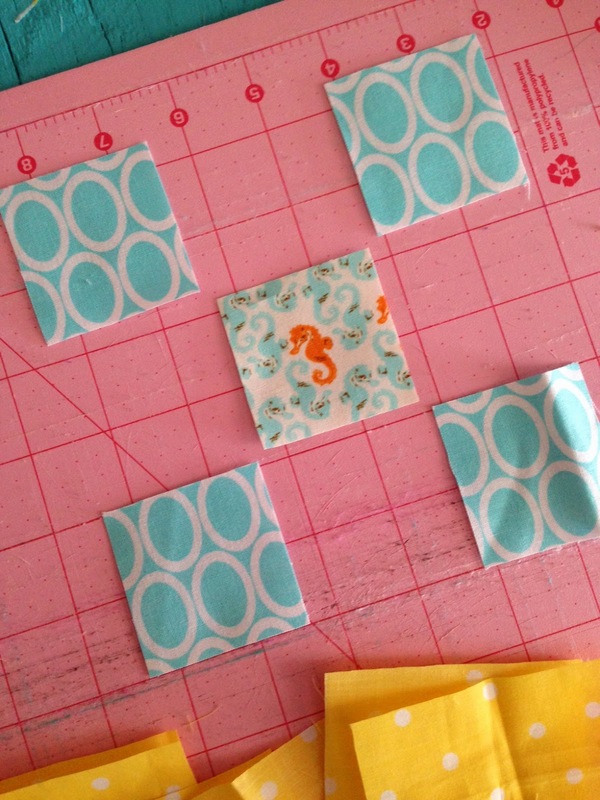 These squares will be your background. You can make them all different if you would like, but for the sake of simplicity for this tutorial, I made them all the same. 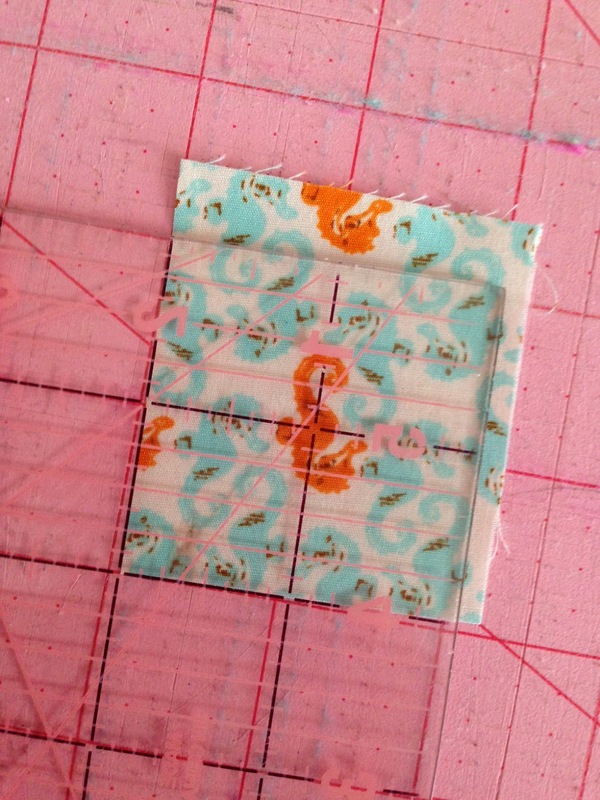 Next I like cut (freehanded) some larger scraps. 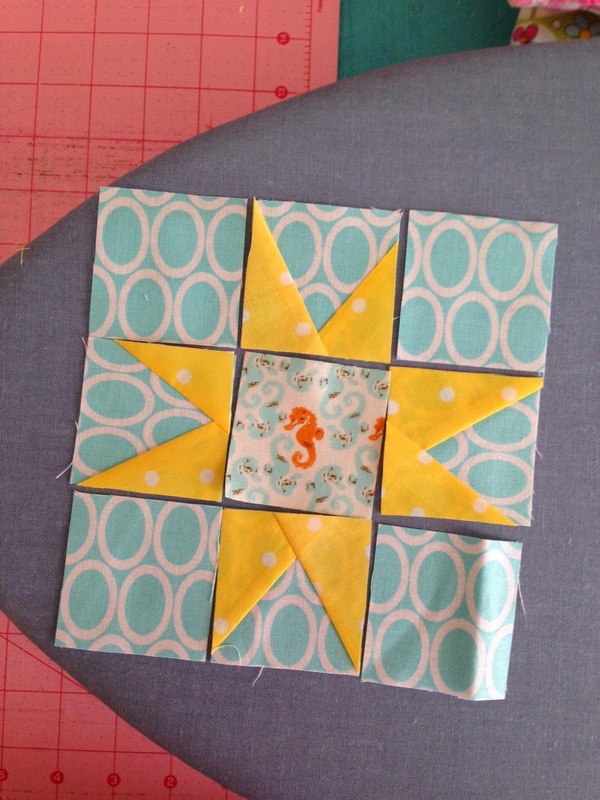 These are about 3in squares. These will form your star points. Again, they can be all different but I wanted to make this simple to follow. 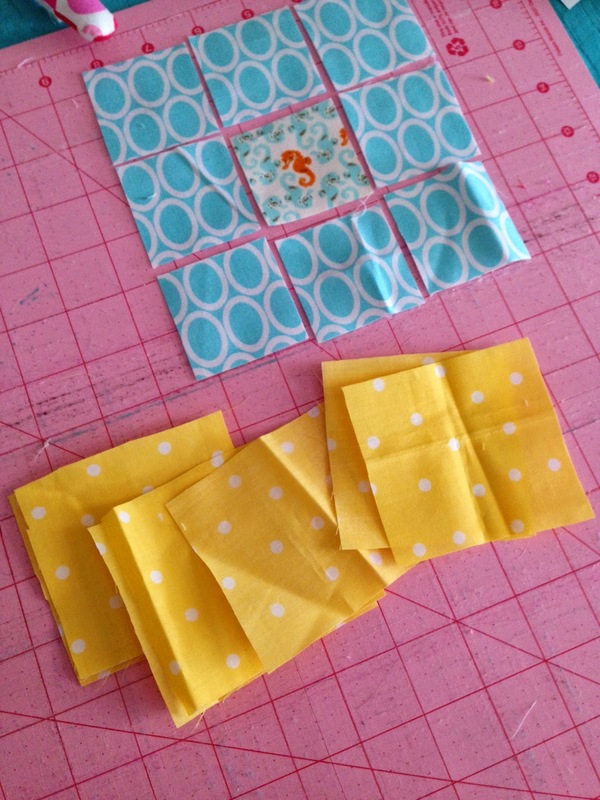 You will work with the squares missing from this photo and your star scraps (yellow fabric here). 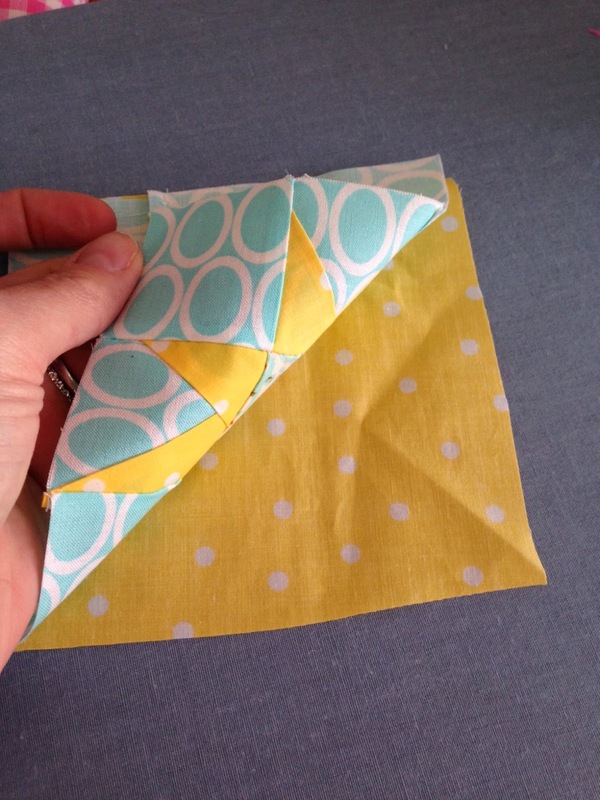 Then fold back. See what I mean? 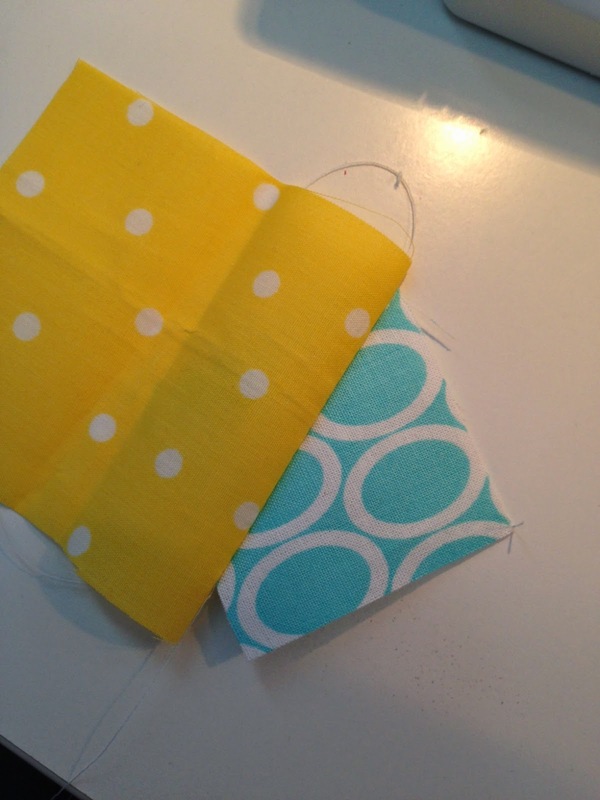 You can't see any of the background fabric peeking out from behind the yellow on the left. You can iron here if you would like. I usually just press with my thumb nail. 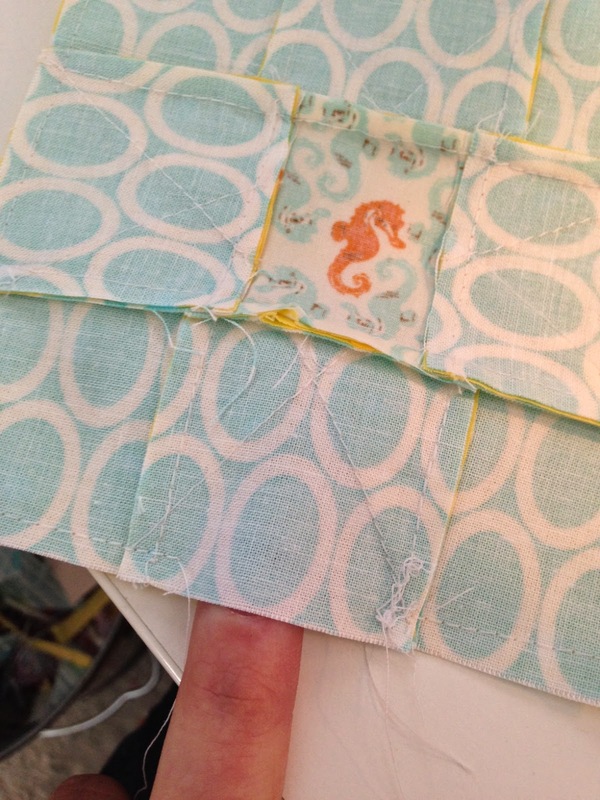 Then fold back and press. Repeat those steps four times. 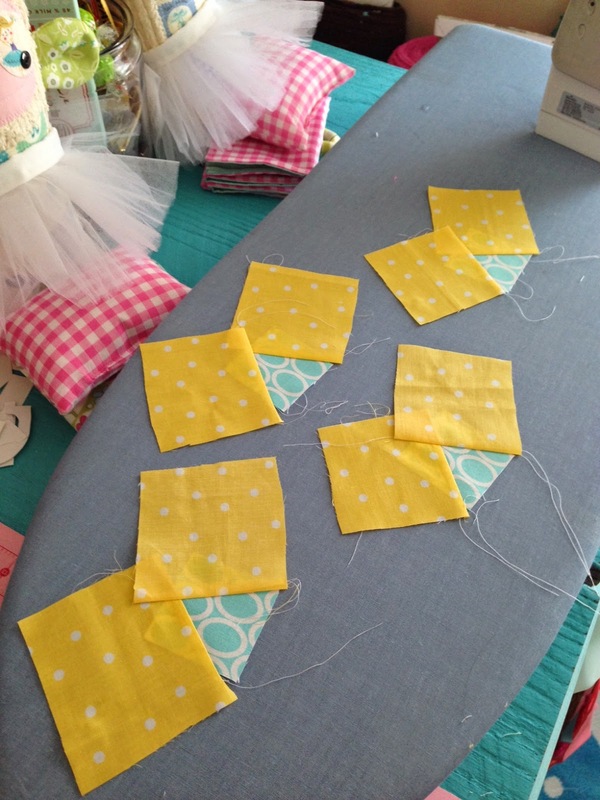 Then iron them nice and flat. 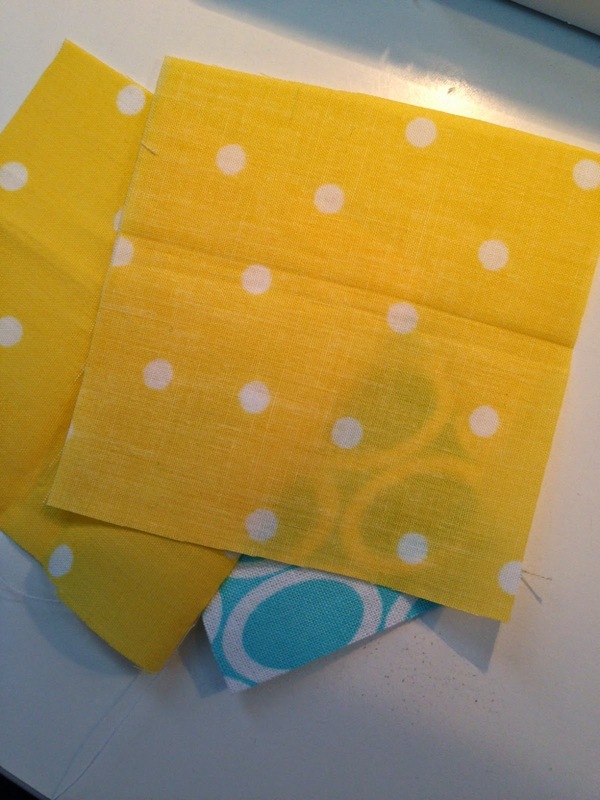 Flip it over and using the background fabric as a guide, trim off the excess yellow. 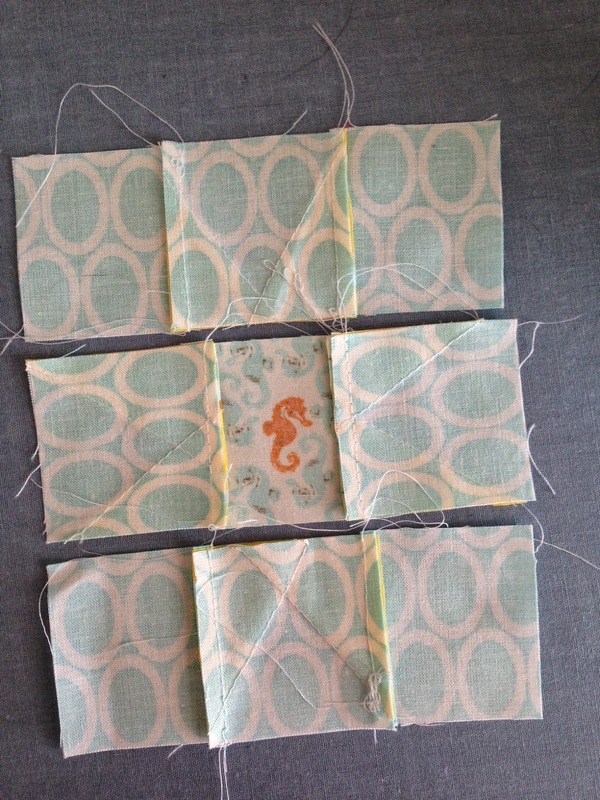 And you end up with four neat squares. 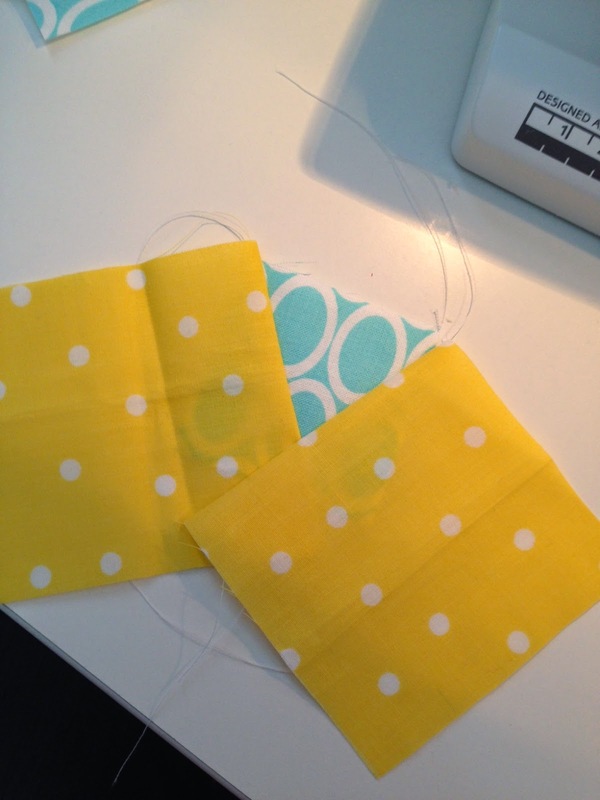 Sew them in rows first and press the seams in opposite directions as shown. 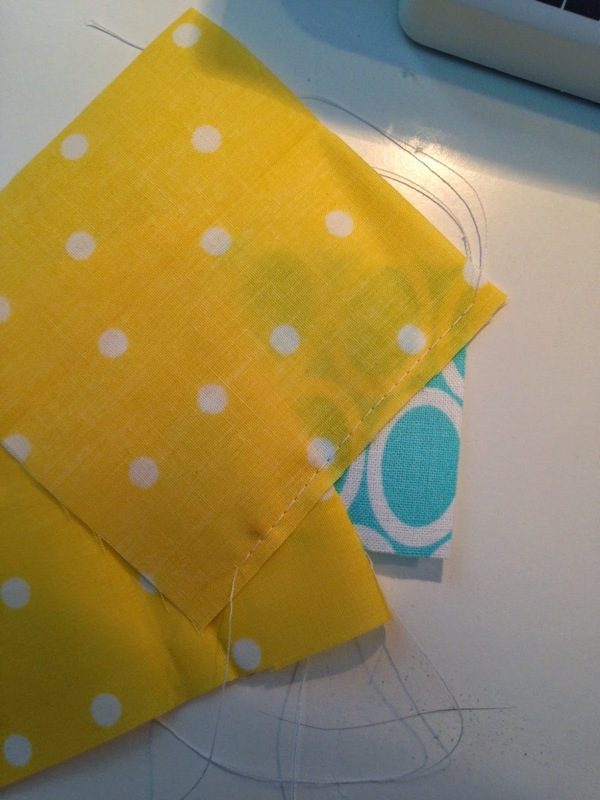 Then sew the rows together, lining the seams up as shown above. 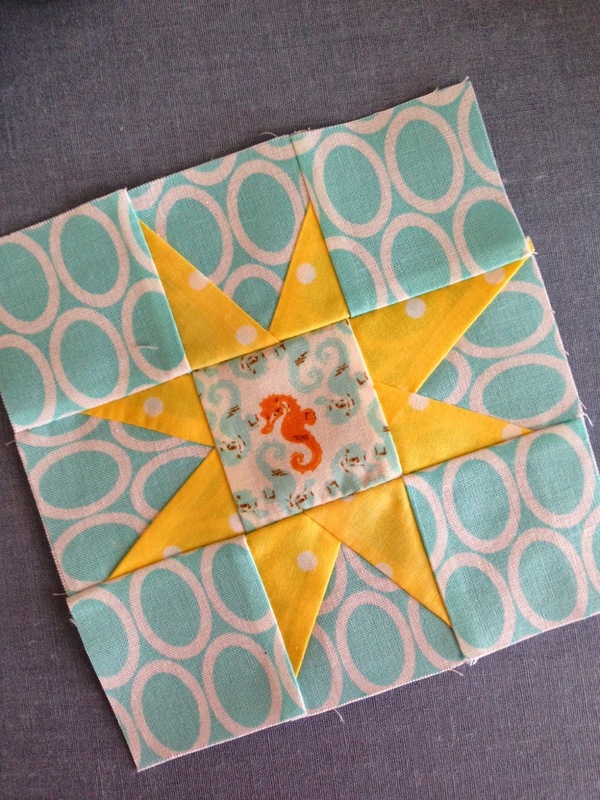 Then cut a backing fabric the same size as your new wonky star square. 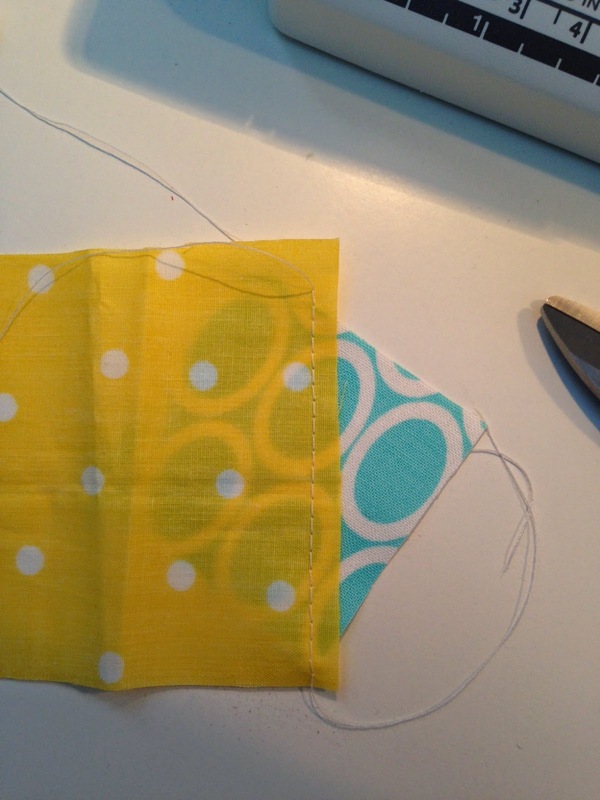 Sew all around the edge leaving a hole. 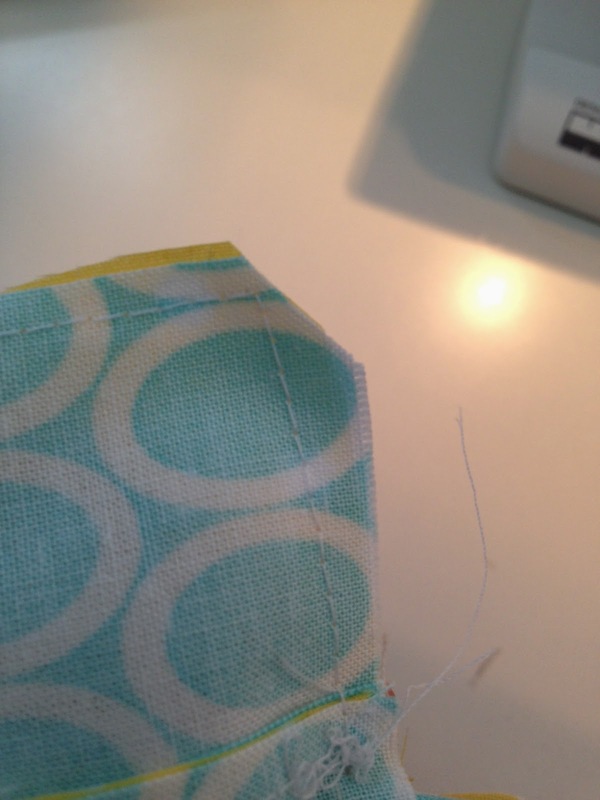 I like to start on the right of a seam and end on the left (as shown above) to prevent pulling the seams when I turn it right side out. 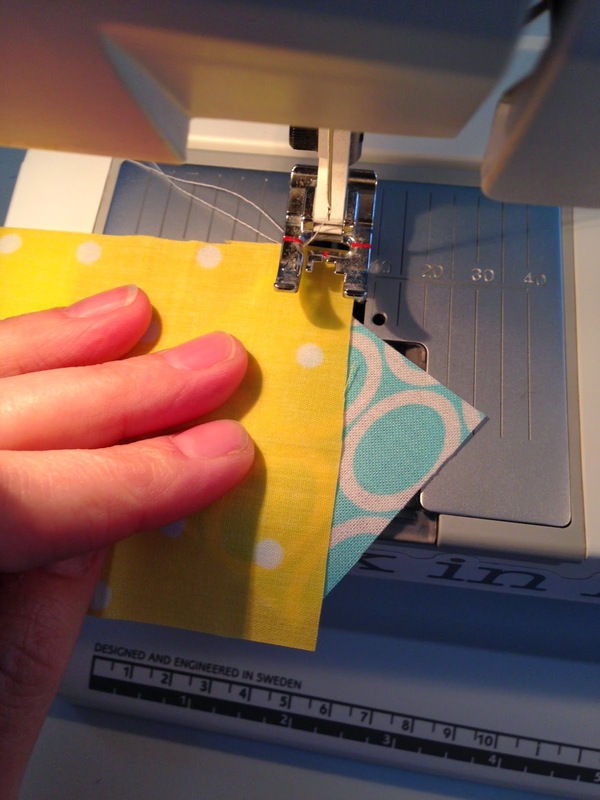 Sew all around the edge again, fill with poly-fil and sew the opening shut! You're done! Wasn't that simple?! 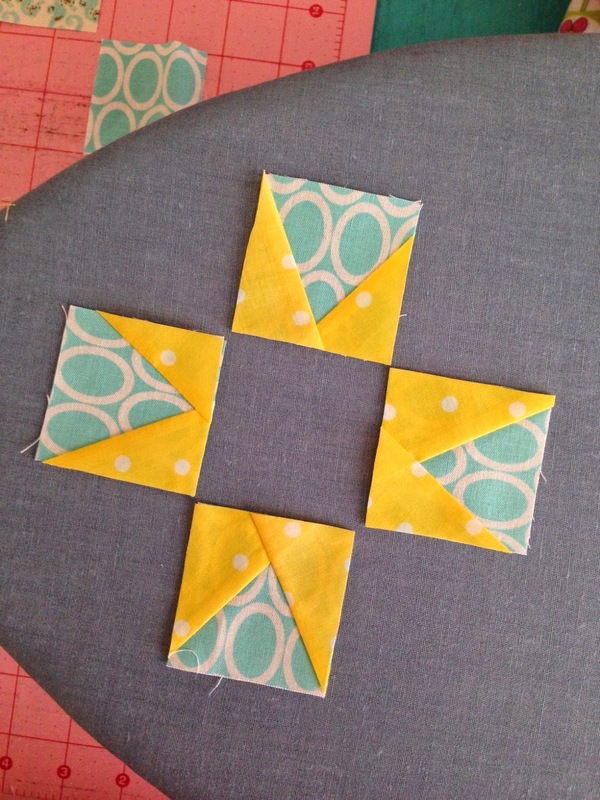 You can easily make the square larger (or smaller eek!) 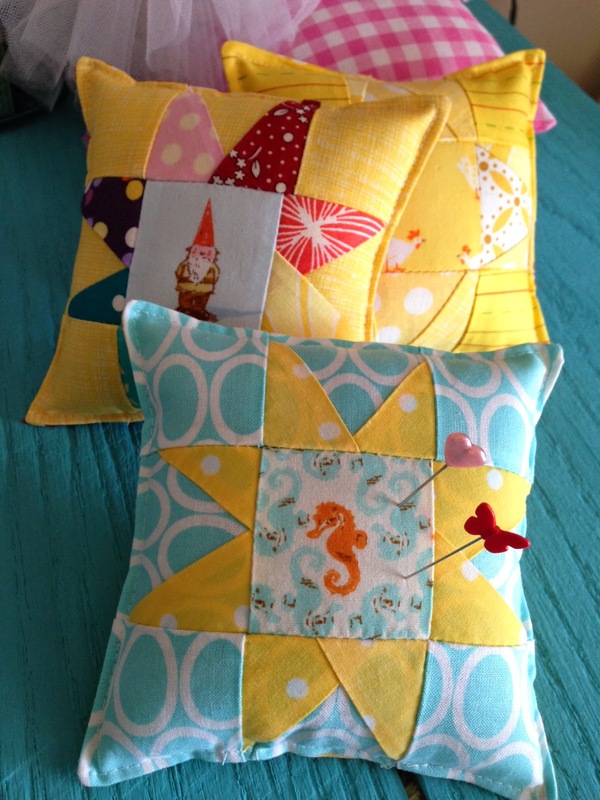 and make pillows or lots of them to make a quilt! SO very cute, Crystal! I love how your imagination works. And I love your sharing heart. Thanks for the tutorial! Hi Crystal! Thanks for the great tutorial. 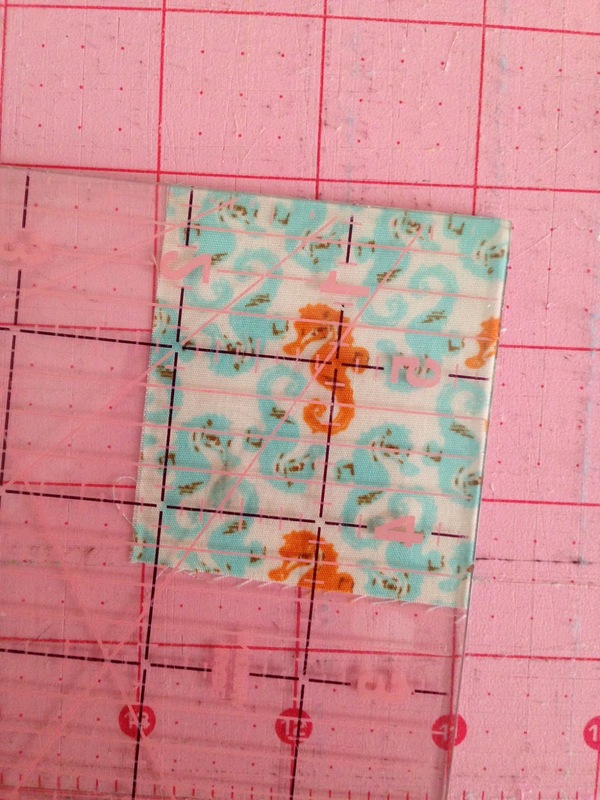 I ended up making one of these as a coaster. 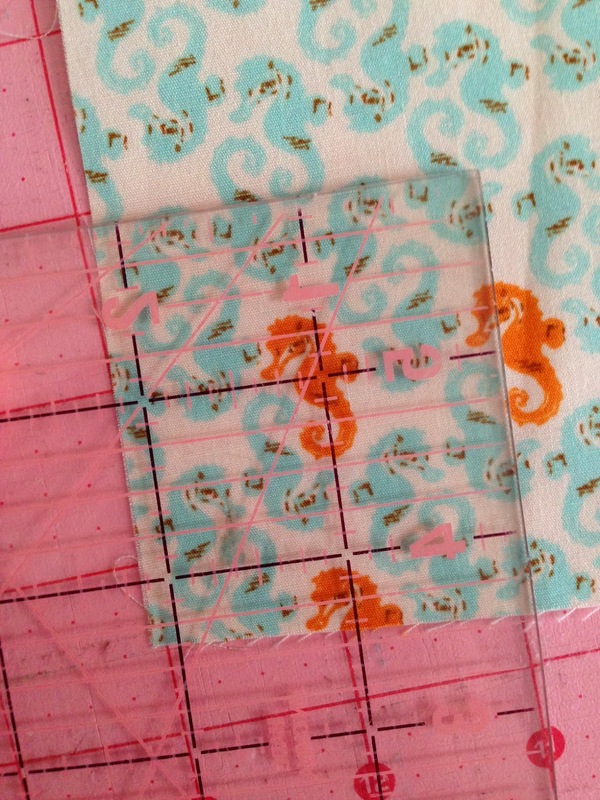 I just sandwiched a layer of batting between the top and bottom layers and sewed all around the edges, then trimmed with pinking shears. 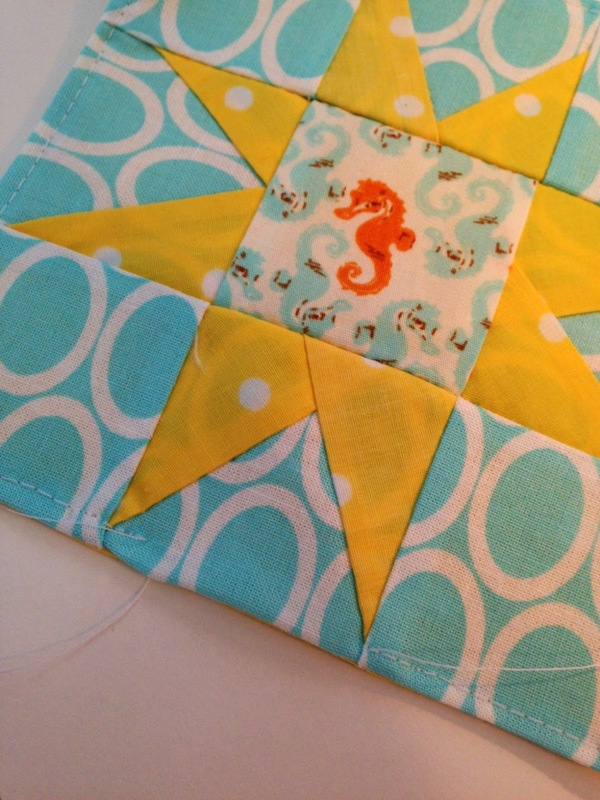 I plan on making more of these for teacher gifts.